Find out what guests are saying about our hotel with an unbeatable location, just 2 blocks from Rehoboth Beach. 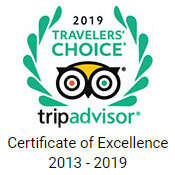 We're not only chosen for the "Best of Rehoboth Award", but also TripAdvisor, AAA, and Mobil Travel Guide are constantly giving us superior quality ratings. And we get why. Our convenient address puts you close to the beach, dining, shopping, and events in Rehoboth Beach. See what the hype is all about for yourself, or share your own experience with everyone. Our favorite place to stay in Rehoboth. It actually feels like home as we've been there a lot. Beds are so comfy, the location is perfect, beach is a short walk. You can park your car and walk everywhere! Love that!